Turkish VAN GÖLÜ, lake, largest body of water in Turkey and the second largest in the Middle East. The lake is located in the region of eastern Anatolia near the border of Iran. It covers an area of 1,434 square miles (3,713 square km) and is more than 74 miles (119 km) across at its widest point. Known to the ancient Greek geographers as Thospitis Lacus, or Arsissa Lacus, its modern Turkish name, Van Gölü, is derived from Van, or Chauon, the name of the capital of the Urartian kingdom that flourished on the lake's eastern shore between the 10th and 8th centuries BC. Roughly triangular in shape, the lake lies in an enclosed basin; its brackish waters are unsuitable for either drinking or irrigation. The salt water allows for no animal life save the darekh (related to the European bleak, a small soft-finned river fish of the carp family), a freshwater fish that has adapted to a saline environment. Lake Van's catchment area exceeds 5,790 square miles (15,000 square km); it forms the largest interior basin of Turkey except for that of the central Anatolian region. The lake is fed by rainfall and meltwater as well as by several tributaries, notably the Bendimahi and Zilan rivers, which flow in from the north, and the Karasu and Micinger rivers, which enter the lake from the east. 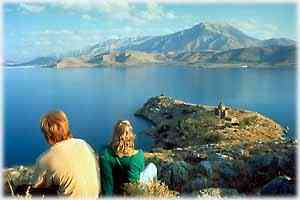 Lake Van experiences a seasonal variation of its water level of about 20 inches (50 cm) per year. It is lowest during the winter months and begins to rise after the spring thaw. With the arrival of additional water from the melted snows of the surrounding mountains, the lake rises to its highest level in July.